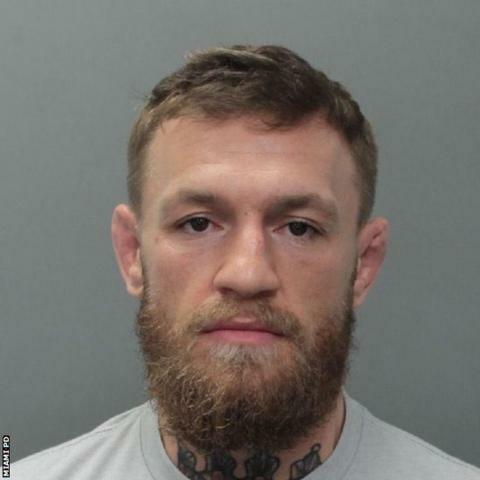 UFC star Conor McGregor has been arrested in Miami for allegedly smashing a fan's phone as they tried to take pictures. The alleged incident took place as the 30-year-old left the Fontainebleau Miami Beach hotel at 05:20 local time. A police report says he knocked the phone out of the fan's hand, stamped on it then picked it up and left with it. "The victim attempted to take a picture of the defendant with his cell phone. The defendant slapped the victim's phone out of his hand, causing it to fall to the floor," the police report said. "The defendant then stomped on the victim's phone several times, damaging it. The defendant then picked up the victim's phone and walked away with it, depriving him of it. The defendant was located and arrested." It added the alleged victim's phone was valued at $1,000 (£760). In a post on social media following his release, McGregor said: "Patience in this world is a virtue I continue to work on. I love my fans dearly. Thank you all." Last year, McGregor was ordered by a court to have anger management training and perform five days of community service in return for the dropping of criminal charges for attacking a bus containing rival UFC fighters. The former two-weight champion has been in Florida preparing for his UFC comeback after losing his last fight to Khabib Nurmagomedov of Russia in October 2018. That came a year after McGregor lost a boxing match, thought to be the most lucrative in history, to multiple world champion Floyd Mayweather. American Mayweather earned a reported $100m (£76m) from the bout, with McGregor thought to have pocketed $30m (£23m).